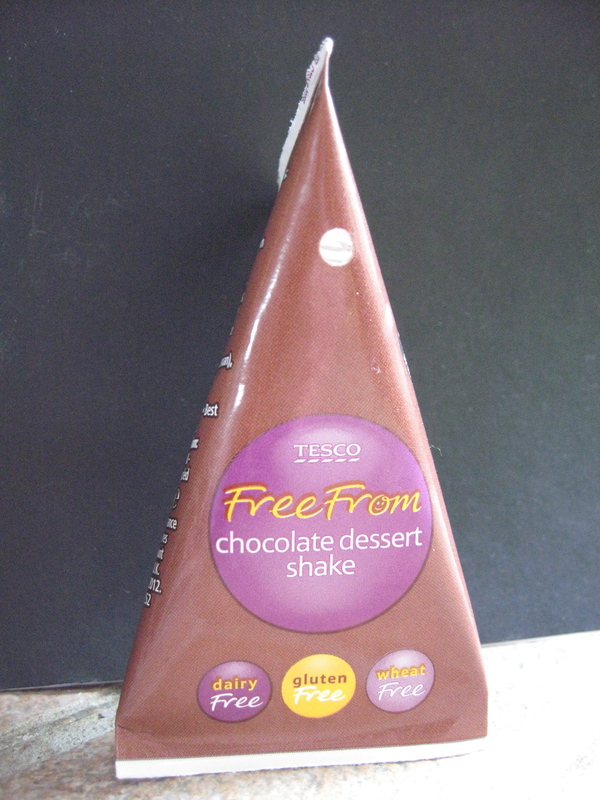 Another fab product from the new Tesco Free From range. These lunch-box sized ‘pudding shakes’ are a bit thicker than a milk shake, but drinkable rather than in pudding form. They come in chocolate or vanilla flavour and certainly fill a gap in the dairy-free portable pudding area. My girls loved them and they proved a huge hit (even with the non-dairy-free members of the party) at our picnic last weekend. It’s just so nice to discover new dairy-free products that are child-friendly, rather than rather serious and lacking in fun because they’re made for a ‘special diet’. It may still be March, but the weather today looks perfect for a trip to the beach. As I’ve mentioned before, picnics are very hard if you are egg/dairy/nut-free. 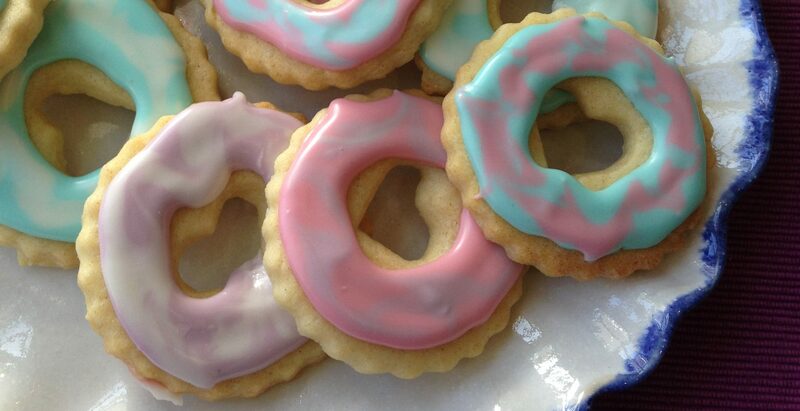 It’ll be sandwiches, crisps, vegetable sticks, fruit and these cookies I made last night. They’re chocolate and orange and hopefully will stand up to the journey…. I’ll post the recipe later, got to make the picnic now! 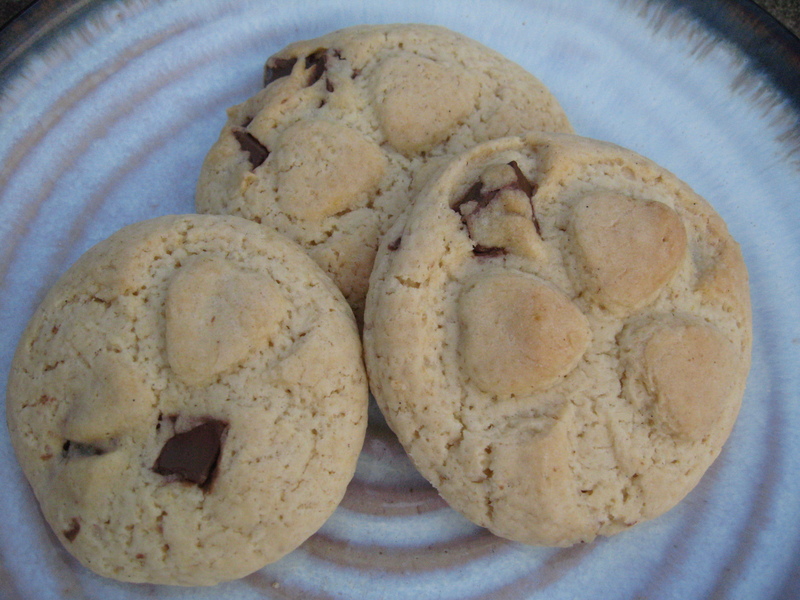 UPDATE: Here’s the recipe, inspired by Vegan Cookies Invade the Cookie Jar. Apparently they’re like Pepperidge farm Milanos – I’m from the UK so that means nothing to me! Sift in the flour, cornflour, baking powder and salt. Mix well. Stir in the chopped chocolate. – Cool slightly, then move to a wire rack to cool. Have you ever been to Food for Thought? This vegetarian restaurant, based in London’s Covent Garden, has been there forever and everyday has a long queue out the door with hungry diners keen to get their plates of goodness. While it can by no means be classed a fine dining restaurant (the vibe is far more veggie cafe) they do serve some knockout dishes, packed full of flavour. 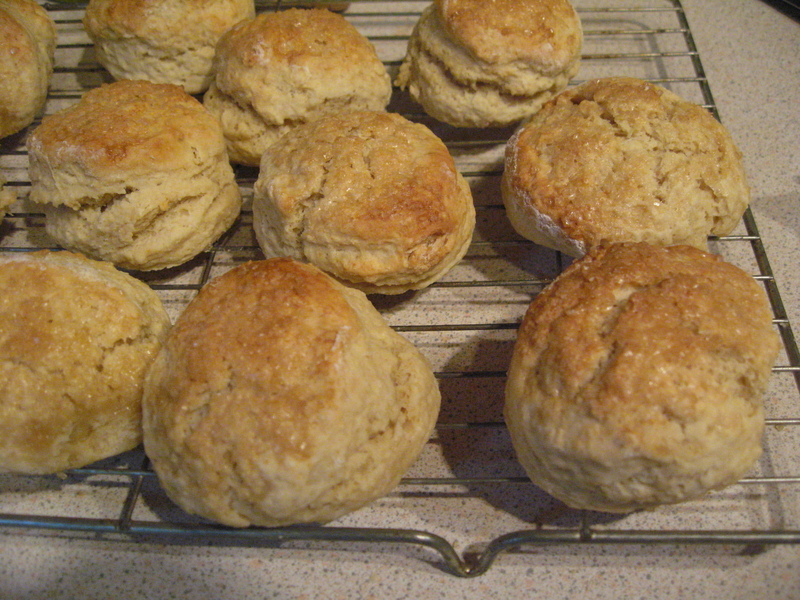 This scone recipe is a real winner, in fact you’d never guess that they’re dairy-free/vegan, and makes a fantastic after-school snack. While we may be a peanut free household, almonds are ok for us (and great for the dairy avoider as they’re full of calcium) so this is our preferred variation. Next time I may try the chocolate version…. 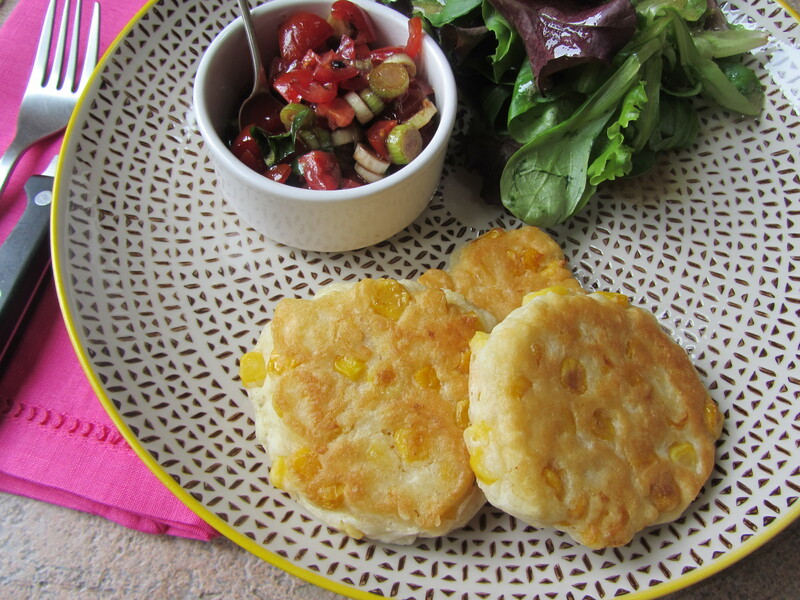 – With your fingertips, rub the dairy-free spread into the flour until it resembles breadcrumbs. 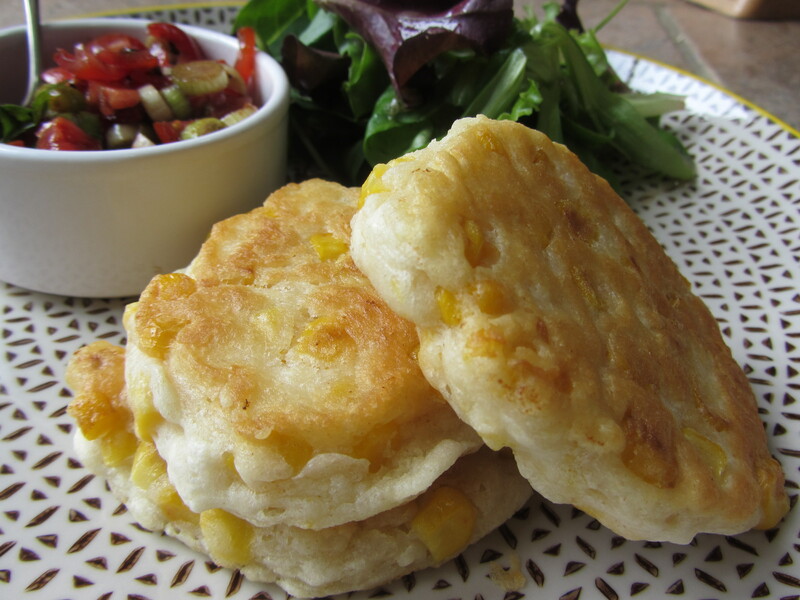 – Turn out onto a floured surface and lightly knead to form a soft ball. – Place on the baking sheet. – Serve hot or cold, with dairy-free spread, jam or honey. 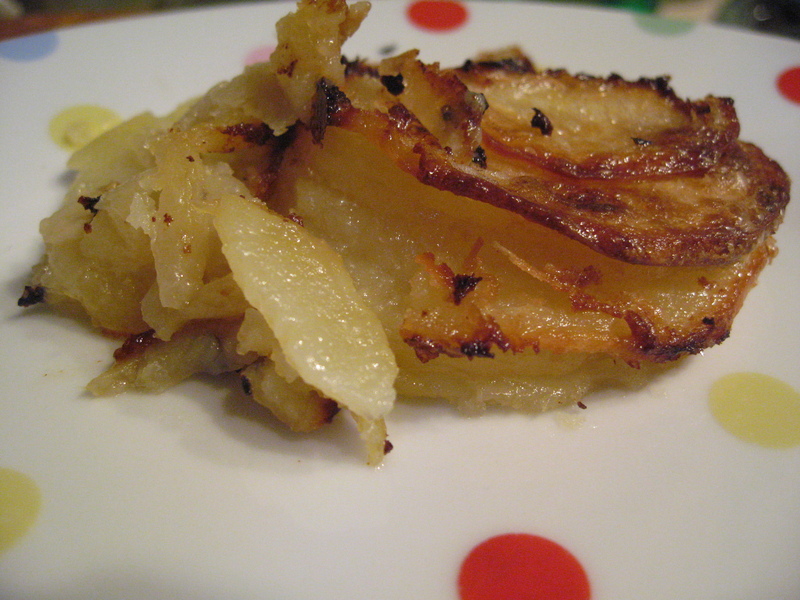 Mmmm, potato dauphinoise is one truly delightful potato dish. While this is by no means as creamy, unctuous and rich as the dairy version (I like Hugh Fearnley Wittingstall’s) it’s a good substitute if you’re dairy-free. The oat milk cream gives a soft, ‘creamy’ richness and it certainly fills the spot of a dinner party-worthy dairy-free potato dish. To make a divine supper serve with ratatouille – yum! Alter the quantities for however many you are serving, this was for a ramekin sized portion to serve one after-school hungry 8 year old! – In a separate bowl, combine the sliced potatoes with enough oat milk to cover and mix well. – Layer the sliced in the dish. – Cook for 45 minutes – 1 hour until golden on top and soft all the way through. From the aisles of the supermarket you’d be forgiven for thinking it’s nearly Easter – and to most little people Easter equals chocolate, possibly Christianity, fluffy bunnies, chicks and more chocolate. But if you are allergic to milk, chocolate is a bit of a nightmare. You’d possibly think that any quality dark chocolate would be fine, but in my experience it normally contains milk solids and so is immediately out of bounds. So the yearly hunt for suitable chocolate easter eggs has begun. 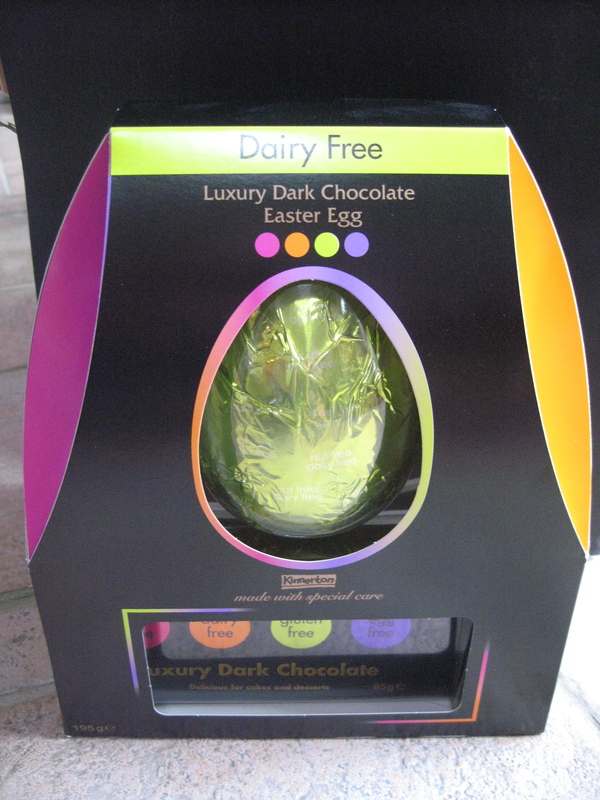 Today I found a Kinnerton dark chocolate egg in Tesco (it’s guaranteed nut free too which is a big bonus) for £5. To be honest, it’s not particularly appealing looking for a child is it? It certainly doesn’t compete with the cute character themed ones most children get to enjoy…. but it’s a start! 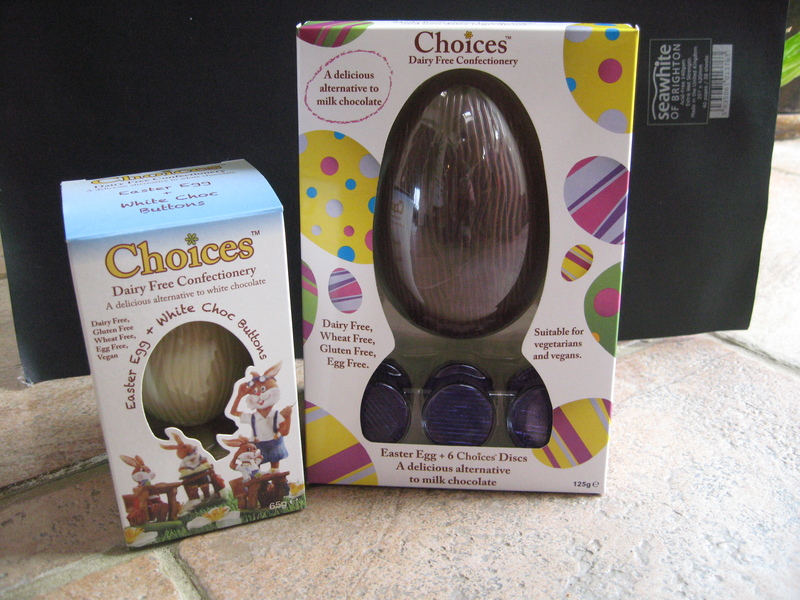 Today’s foray to a Holland and Barratt uncovered a couple more dairy free chocolate egg options by Choices. there were three varieties, dark, milk and white. All of them are dairy, egg and gluten free. My children will probably prefer the dark (because they’ve never known milk chocolate like other kids, they don’t tend to like the creamy taste! ), but I bought one milk and one white for one of their Grandmothers to give them at Easter. These are a little more child-friendly, but it still isn’t Hello Kitty is it!